Amazon Echo is voice-based home automation. With it, you can listen to music, check the weather, or search the web…just by using your voice. And just like mobile phones and tablets, lots of exciting apps are going to be written for this new platform, using the Alexa Skills Kit (ASK) and AWS Lambda. Together, they offer a completely managed platform for voice recognition and cloud compute. video illustrates this in action. As mentioned in the video, the code is a trivial modification of the “MyColor” skill; I changed the color parameter to a message, and added an HTTP request to Slack at the point where the message is created. If you try this yourself, you’ll have to replace the http “path” option with your own Slack token to get it to work. Finally, testing your code (and Slack integration) from the Lambda console is super useful, but you’ll need to replace the “Color” section in the Alexa sample event (Alexa Event – MyColorIs) with a “Message” equivalent to get it to work with the code below. 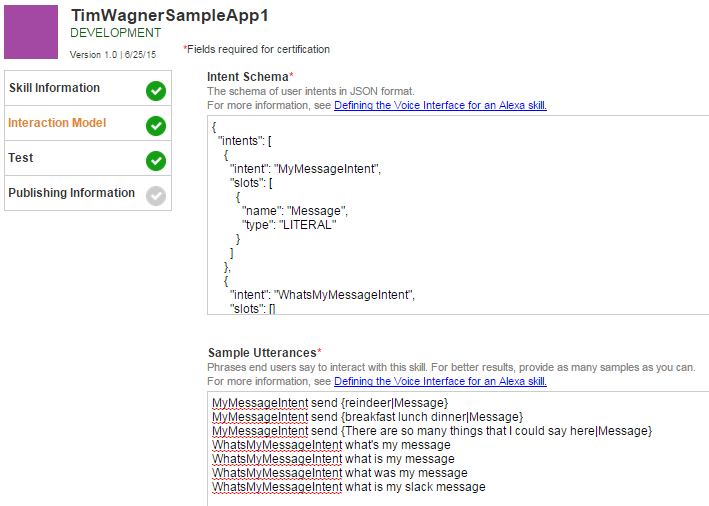 * This sample shows how to create a simple Lambda function for handling speechlet requests. * to prevent other voice applications from using this function. * Called when the user launches the app without specifying what they want. * Called when the user specifies an intent for this application. * Is not called when the app returns shouldEndSession=true. * Helpers that build all of the responses. * Functions that control the app's behavior. var speechOutput = "Welcome to the Alexa and Lambda demo app, "
+ "You can give me a message to send to our team's Slack channel by saying, "
var repromptText = "You can give me your message by saying, "
* Sets the message in the session and prepares the speech to reply to the user. speechOutput = "Your message has been sent. You can ask me to repeat it by saying, "
repromptText = "I didn't hear your message clearly, you can give me your "